This is what the future museum of SGRLPS will look like. The Good Old St. George Lighthouse Museum is coming soon. USPS STAMP 2007: The St. George Reef Lighthouse is now a United States Postal Stamp and was released on June 21, 2007 as a .41 cent stamp. We have a special - limited - stamp done on day of issue. Contact Bill at billjr@odonnell.ws for details. Also we have a special canceling stamp done too by the USPS for July 4th, 2007. We were part of a special ceremony on June 21st at the Crescent City Post Office. Odonnell Entertainment Adventures of Shadow® is updating the DVD of the event and a limited number of DVD covers were canceled with first day stamp. We had some of the DVD’s available in 2007 and will have them available again for the Tenth Anniversary of the Stamp was issued. This was the photo the U.S.A. In 1995, the SGRLPS dedicated "Paysonville", the site on Humboldt Bay where the granite used in the construction of the lighthouse was processed. There is a historic plaque at this location, and a large interpretive panel which illustrates the tools and techniques used to build the structure. Five Pacific Lighthouses will be immortalized on stamps for their important role in safeguarding mariners navigating waters. The five Pacific Lighthouses stamps will honor Diamond Head Light in Hawaii, Five Finger Light in Alaska, Grays Harbor Light in Washington, Umpqua River Light in Oregon and St. George Reef in Northern California. 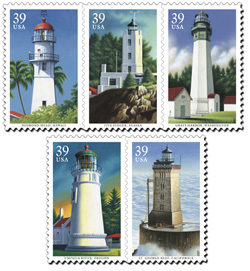 Each stamp features an original acrylic painting by Howard Koslow based on recent photographs of the lighthouses. Koslow also painted the five Southeastern Lighthouses stamps issued in 2003, as well as the five stamps in the 1990 Lighthouses booklet and the five Great Lakes Lighthouses stamps issued in 1995.St. George Reef Perched on an exposed rock off the coast of northern California near Crescent City, St. George Reef Lighthouse took 10 years to build. From 1892 until its deactivation in 1975, the light from this concrete and granite tower warned vessels away from the hazardous reef hidden beneath the surface. St. George Reef Lighthouse stands on an exposed rock off the coast of northern California. Visible from nearby Crescent City, the light from the tower's black cast-iron lantern began to warn vessels away from the hazardous reef hidden beneath the surface in 1892. Because continued exposure to the unforgiving elements made maintenance expensive and duty dangerous, this concrete and granite sentinel was deactivated in 1975. The St. George Reef Lighthouse Preservation Society is a nonprofit organization dedicated to restoring the lighthouse. In 1993 the society successfully nominated the tower to the National Register of Historic Places, and in 2002 it installed a new lens. The text that was mention above will be on the stamp too. It was written by Mary Stephanos at PhotoAssist, Inc.; Guy Towers, Terry and Bill Odonnell, Jr. all three with SGRLPS. The stamp as you can see his a little different than the photo a few people at SGRLPS had some ideas that the art director took. They wanted it to look like what it may look like after we finish restoring the light. The Del Norte County Museum located at 577 "H" street in Crescent City, has an excellent collection of material from St. George, including its magnificent Fresnel lens. A special two-story viewing room was built to house it. In addition, the museum has a collection of material from St. George, including photographs illustrating its history.